I spent an afternoon tramping around Washington Park yesterday. Besides enjoying the warm weather I wanted to exercise my photographer’s eye. I took my Canon XTi and 75-300 lens with me for some practice. It turned out my photographer’s eye wasn't the only thing that needed exercising. What went wrong here? Two things went wrong. The camera has three different ways of measuring exposer. 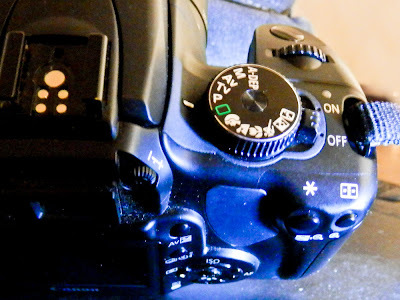 Evaluative metering is the camera's default metering method. Evaluative metering examines the entire frame and calculates an averages exposer; it is suitable for most photos. 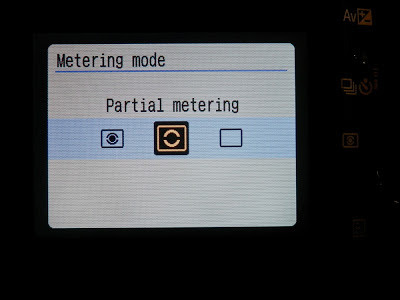 Partial metering is almost like spot metering; it calculates the exposer using only the center of the frame and is suitable for strong back lighting conditions. Center-weighted metering is a compromise between Partial metering and Evaluative metering; it uses the entire frame but places more emphasis on the center of the frame. Center-weighted metering is good for when the photographer wants to modify the exposer just a little using the exposer compensation dial. I've had problems blowing out the sky in some of my pictures. I changed the metering mode to Partial metering (spot metering) thinking it would give me better control over the bright clouds. Changing the metering mode was a reasonable thing to do assuming I knew how to use it. When you point the camera at a subject and press the shutter button halfway the automatic focus will engage and focus the lens. If you continue to hold the shutter button halfway down the camera will hold that focus setting while you re-compose your picture. My mistake was forgetting that the camera only holds the focus point and not the exposer setting. I would zoom in on my primary subject, press and hold, zoom out and re-compose. That works fine for auto focus but not for auto exposer. To use the zoom press and hold technique for exposer metering I needed to also press the * button. It's not necessary to hold the * button in - just press it once with my thumb and it will hold the exposer setting for 4 seconds long enough to re-compose my shot. I wasn't wrong to change the metering mode, though Center-weighted might have been a better choice, the problem was I didn't know how to use the advanced metering mode. Having an interesting subject and a good composition is important, but knowing how to use my equipment is equally important. That's what practice is all about. 2 adults & 2 juveniles. Don't use auto focus when taking pictures of birds in trees; the branches and twigs in the tree confuses the auto focus. It isn't the bird that's out of focus, it's the picture that's out of focus, but it's not too bad. Denver has had a stretch warm days so I've taken the motorcycle out a couple of times this week. 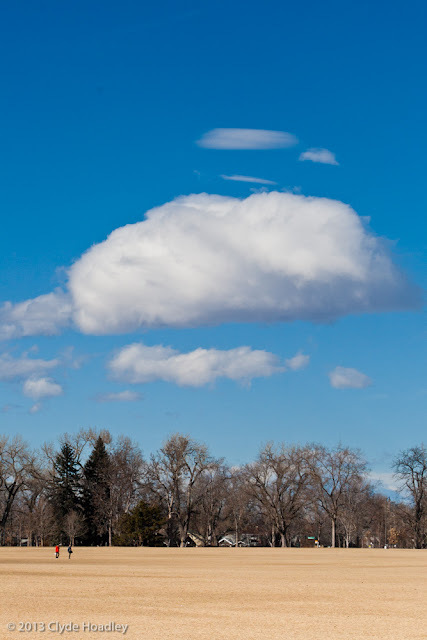 Saturday I grabbed my camera and rode out to the Rocky Mountain Arsenal Wildlife Refuge. There were a lot of people visiting the refuge Saturday. I didn't see a lot of wildlife. That's how it is - somedays you see a lot of wildlife and somedays you don't. The time of day makes a big difference too. I saw a lot of Bald Eagles but they were too far away to photograph. 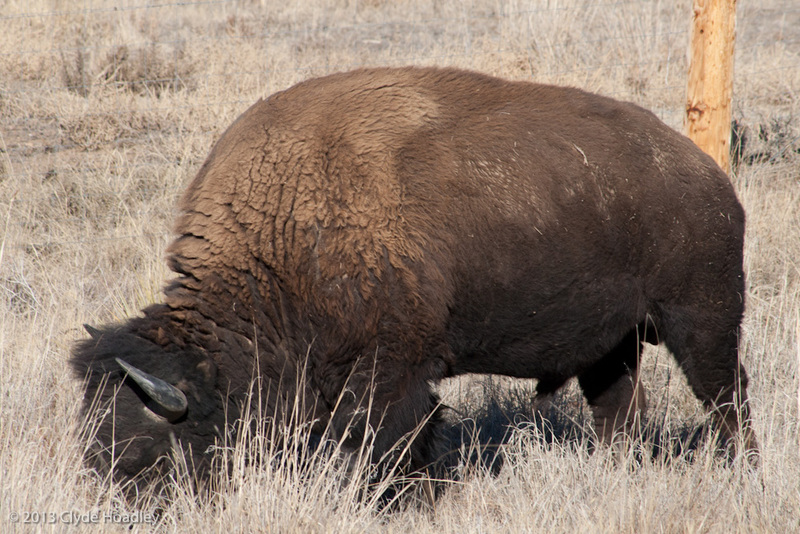 This Bison was right next to the road; she was more interested in the grass than she was us tourists. It would have been a better picture if I waited for her to lift her head. oh well, live and learn.